College football season is a time for tailgating, party hosting, and all things NCAA. If your husband is anything like mine, it’s been all football all the time lately. College football season also means that fall is near and I like to use each new season as a mini “fresh start.” Whether it’s spring cleaning the house, giving my wardrobe a new makeover or mixing up our routines a bit. But this season is not about me. This one is about you fellas. While your boys are out there defending their turf (and scoring you points in your college fantasy league) it’s a good time to think about how you’re taking care of your turf. Sponsored post by Mirum Shopper. All opinions are my own. 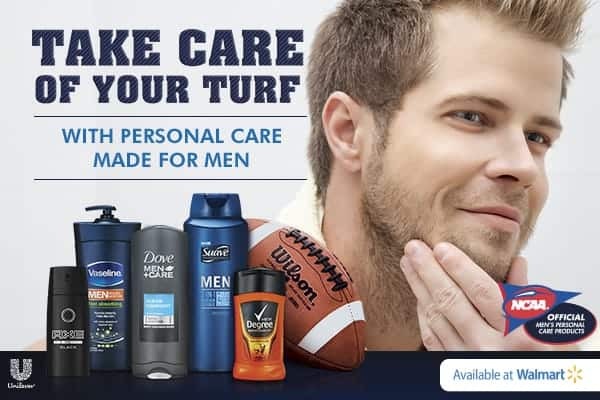 Unilever is the NCAA partner, not Walmart. You can pick up everything you need to take care of your turf at Walmart. You can also find the supplies for these genius tailgating tips. Carry a toolbox packed with tailgate essentials like aluminum foil, barbecue brushes, tongs, plastic wear, trash bags, toothpicks, paper towels, plastic baggies, condiments and more. Keep soda, water and alcohol in separate coolers, label the coolers to make finding the beverage of your choice easier. Skip ice and freeze water bottles instead. Bring a metal bucket to store hot coals from the grill. Use squeeze water bottles and hand sanitizer to create a hand washing station. Pack baby wipes – they’re great for clean up! Shape burger patties the night before and pack them between sheets of wax paper, then pack them in reusable plastic containers. Pack your toppings like cheese, lettuce and tomato in plastic containers to keep them from getting smashed and for easy reseal. When it’s cold, create a soup bar out of thermoses. Serve the soup in bread bowls and skip the paper products! Mason Jars RULE. Use them to store barbecue sauces, toppings, condiments, create corn bread, store (and serve) chili and more! Pinterest is FULL of amazing mason jar recipes.